The male's side asks a matchmaker to go to the female's family to express that the male's family is willing the marry the male with the female of the other family. Exchange of birth date/time data of the man and woman being matched. The birth data is called The "Eight Characters of Birth Time" or "Four Pillars of Destiny". The male side's matchmaker sends brief gift to female side to confirm that the couple's horoscopes manifested from their birth data comply with each other. Male side gives betrothal gift to the female side. If the gift is accepted, the engagement is completed. Male side asks a fortune-teller and proposes a lucky wedding date, then goes to female side to ask for confirmation. On the confirmed wedding day, Groom goes to bride's parents' home to fetch the bride. The above six-step wedding ritual started from Zhou Dynasty (1045B.C - 256B.C.). These are the full steps and are regarded as being very formal. In later dynasties, in ordinary family's weddings some of the steps are reduced. Groom and bride worship the shrine together. This is also called "worshiping the heaven and earth". This is to pay respect to gods and ancestors. Nowadays, three kowtowings are to be done by the couple. The first one is to kowtow to heaven and earth; the second one is to kowtow to parents; the third one is to kowtow to each other. Before the start in Chinese wedding banquet, the groom and bride are served with water for washing hand. In the ancient Chinese book "The Ritual Book", it says,"A young person holds a plate while an elderly person takes a water container to pour water. The groom and bride are asked to wash their hands. After washing, a towel is provided." The drinking of wine is for the couple to drink wine using two cups connected with five-colour threads. Nowadays, the ritual is implemented by letting the couple drink a little wine in each one's cup first, then exchange the cups and finish drinking the rest at once. In traditional Chinese wedding customs, the bride's head is covered by a piece of red cloth from the moment of leaving her parent' home until the cloth is removed by the groom in the bedroom of the new couple. It is often the case that the groom and the bride has never seen each other before this moment. So modern people may be difficult to imagine the kind of feeling of ancient couples when they firstly see each other. Chinese wedding ceremonies in different areas may have a little variations, but all Han tribe Chinese wedding customs are more or less the same. Nowadays, wedding ceremonies are mostly a big festive banquet in people's mind. What the groom and bride think most are the expenses in the wedding ceremony. People tend to forget about the essential meaning of these wedding ceremony rituals. The essential meaning of these rituals is to make the marriage be witnessed and recognized by heaven and earth, parents, relatives and friends. All these rituals are to make the marriage a formal process so that it will strengthen the loyalty between the husband and wife and keep the marriage relationship stable and permanent. This essential point is the same as in western wedding ceremonies, where the rituals are held in church. Actually the traditional Chinese wedding process in which the matching is decided by parents has mostly been abandoned in modern China. Such change in wedding customs started from a century ago in China. People nowadays prefer the free self-decided matching process. 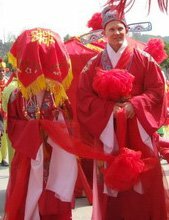 In modern people's point of view, the traditional parents-decided matching process was unaccpetable or is regarded as being absurd because traditional Chinese culture has been totally damaged in China and Chinese people have forgotten the real meaning of traditinal Chinese wedding customs. Please see my another page on the origin of Chinese wedding traditions. Go to top of page "Rituals in Chinese wedding customs"
Return from "Rituals in Chinese wedding customs" to "Foreigners in China" Home Page.